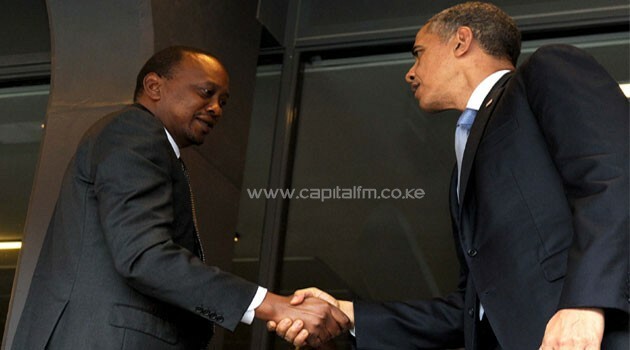 By PSCU, JOHANNESBURG, South Africa, Dec 10 – President Uhuru Kenyatta exchanged a historic handshake with his US counterpart Barack Obama on Tuesday – the first time the two were meeting after Kenya’s elections in March. The two presidents were among over 90 leaders from across the globe who braved a heavy downpour to attend the epic memorial service for former South African President Nelson Mandela. The historic memorial state service also attracted thousands of mourners from all walks of life who thronged the FNB stadium in Johannesburg to pay their tribute to the world icon and anti-apartheid hero. The handshake was telling due to the ongoing International Criminal Court trials of Kenyatta and is deputy William Ruto. America, though not a party to the court, has often been seen to advocate for the conclusion of the trials. The US is a permanent member of the UN Security Council which has twice thwarted attempts by Kenya and the African Union to have the Kenyatta-Ruto trials delayed. Speaking at the service, Obama paid glowing tribute to Mandela. He described him as a person who demonstrated that action and ideas were not enough –no matter how right –they must be chiselled into laws and institutions. He said Mandela was practical and tested his beliefs against the hard surface of circumstance and history. “On core principles he was unyielding, which is why he could rebuff offers of conditional release, reminding the Apartheid regime that, ‘prisoners cannot enter into contracts’. But as he showed in painstaking negotiations to transfer power and draft new laws, he was not afraid to compromise for the sake of a larger goal,” President Obama said. In his tribute, United Nations Secretary-General Ban Ki-Moon said Mandela was a unique leader and one of the world’s greatest teachers. South African President Jacob Zuma said the passing on of Mandela marked an unprecedented outpouring of grief across the world tinged with admiration and celebration. “Everyone has had a Mandela moment, when this world icon has touched their lives. That we are Madiba’s compatriots and have lived during his time, is a cause for a great celebration and enormous pride. Never before has our country celebrated a life as we are doing with that of Madiba,” President Zuma said. He described the late Mandela as a courageous leader who laid a firm foundation for the South African dream of a united, non-racial, non-sexist, democratic and prosperous country. President Zuma observed that it is only selfless leaders –like Mandela –who are able to abandon their narrow concerns for bigger and all-embracing dreams, even if those dreams come at a huge price. “Madiba embodied this trait. He was a fearless freedom fighter who refused to allow the brutality of the apartheid state to stand in the way of the struggle for the liberation of his people,” the South African President said. To Mandela, President Zuma recalled, for South Africa to attain peace the armed struggle was inevitable but only as a means to an end and not an end in itself. He said Madiba’s love for peace was also evident in the work he did in the continent, citing the example of Burundi which today enjoys peace and democracy because of the seeds planted by Mandela. Beyond promoting reconciliation, President Zuma said, Madiba also laid a great foundation for transformation as well as reconstruction and development. “Under his leadership, the new democratically elected government focused on addressing historical injustices and creating new institutions to facilitate the building of a democratic society based on the principles of non-racialism and non-sexism,” he said. Other speakers included Brazilian President Dilma Rousseff, President Hifikepunye Pohamba of Namibia, India’s President Pranab Mukherjee and President Raúl Castro Ruz of Cuba.